Researchers at Big Cypress National Preserve caught the largest python ever found in the Everglades area just west of Miami. According to the Facebook post that accompanied the eye-popping photo, the female python was more than 17 feet long, weighed 140 pounds, and contained 73 developing eggs. Scientists explained they were using a new research program using radio transmitters to track male pythons back to their nests to locate breeding females. It was this tracking program that lead the team to this giant breeding female. 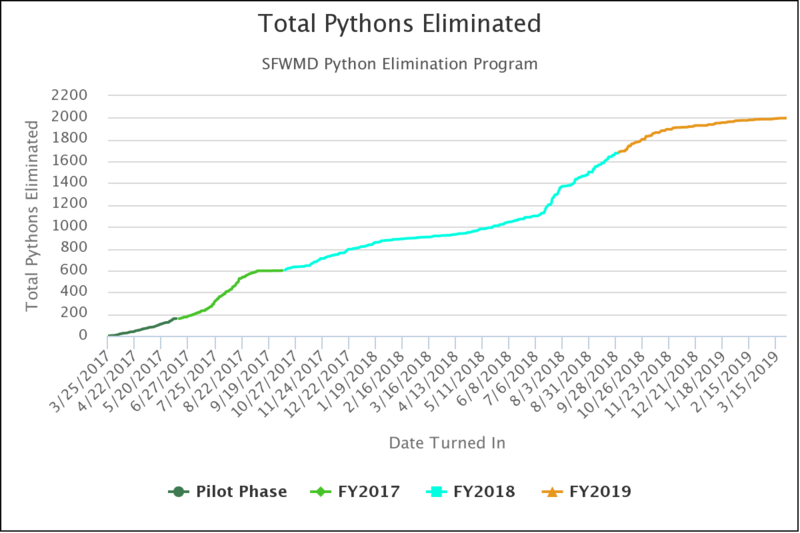 The team not only removes the invasive snakes, but collects data for research, develop new removal tools, and learn how the pythons are using the Preserve. 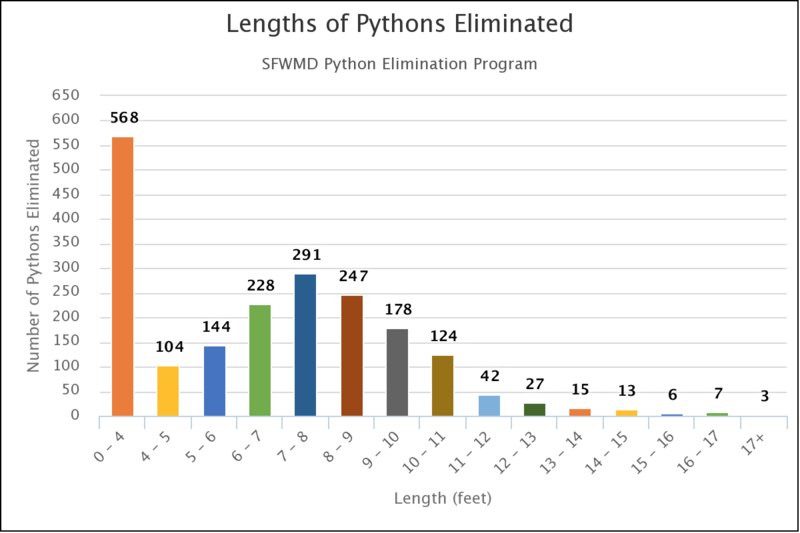 In 2013, the Florida Fish and Wildlife Conservation Commission held the Great Python Challenge. It was conceived as a way to raise awareness about this invasive species’ threat to our native wildlife and our fragile Everglades ecosytem. 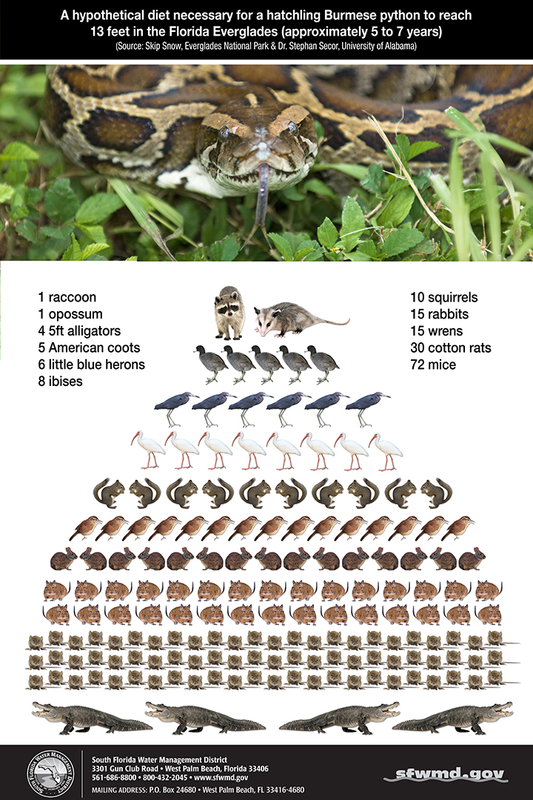 The snakes, which grow to around 15 feet and can weigh more than 200 pounds, have no natural predators in Florida. The pythons are known to eat our protected Key Deer, alligators, endangered wood storks – whatever they can catch. And they are voracious eaters according to The Nature Conservancy, eating nearly 200 pounds of food in five years. While researchers have been hard pressed to provide specific population numbers in the Everglades, a rapid number of increased sightings from 2005 to 2010 is concerning. The species was once relegated to only Everglades National Park and Miami-Dade County, but recent tracking shows pythons are moving westward into locations such as Big Cypress National Preserve and northward into Broward and Palm Beach counties. 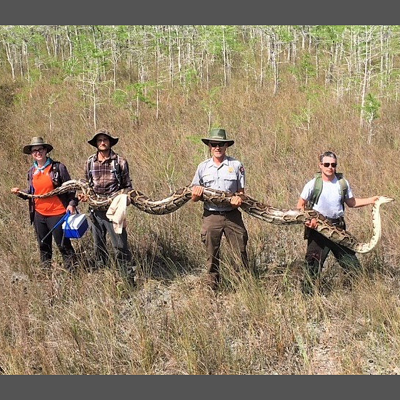 The snake is the largest python ever removed from Big Cypress National Preserve, a 729,000-acre expanse of swampland west of Miami in South Florida, according to a statement Friday on the preserve’s Facebook page.